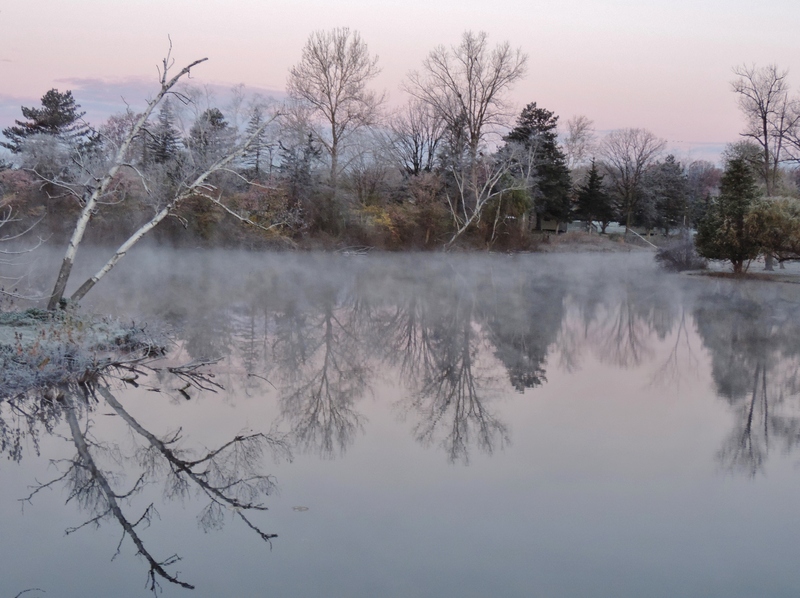 In the dawn’s early light, an almost magical mist rises from peaceful lakes, reminding us of nature’s raw beauty reflected in the cold days of late autumn. In the dawn’s early light, geese settle on ponds and calm waters, preparing for their great flight south. 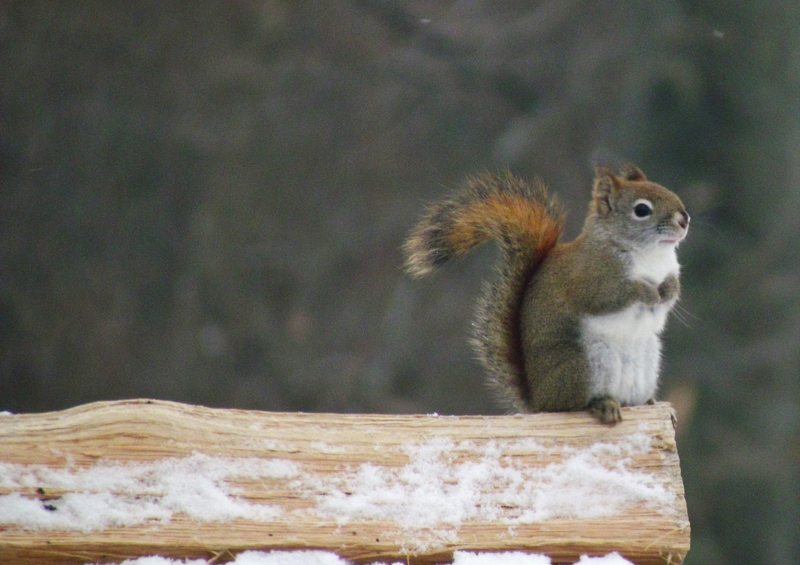 In the dawn’s early light, a lone red squirrel surveys his kingdom of mighty oaks, perhaps wondering how many days are left to gather a bountiful cache of acorns for the dark days of winter. 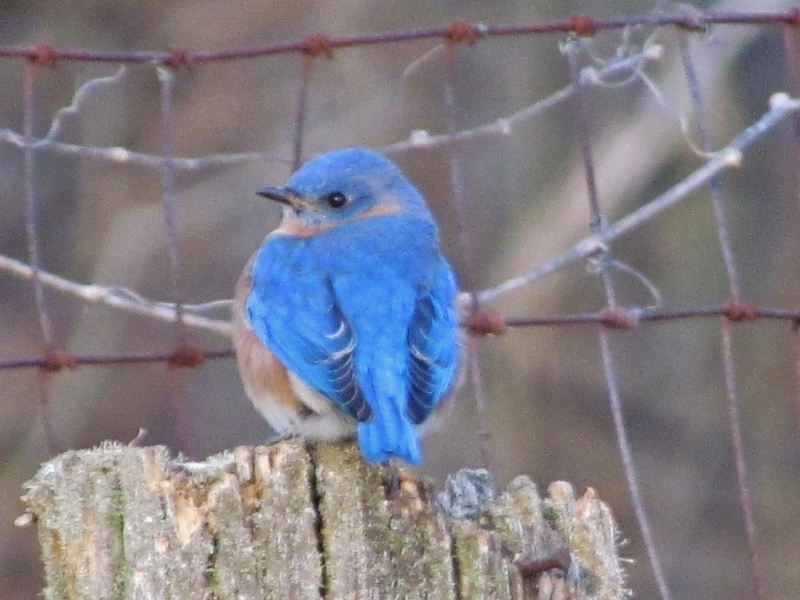 In the dawn’s early light, an eastern bluebird, that chose not to migrate, maintains his fence post lookout and fluffs his feathers against a biting wind. 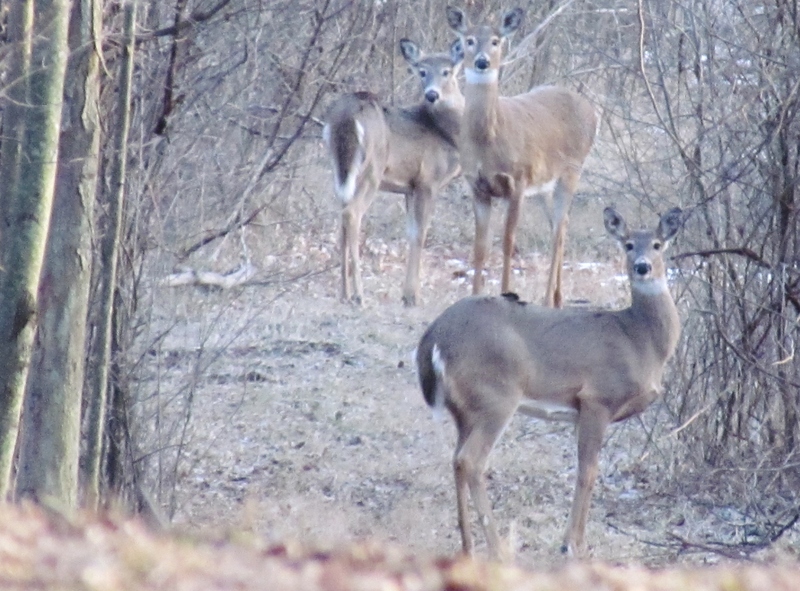 In the dawn’s early light, a trio of deer pause to watch a camera-armed human intrude and, after a few seconds of wariness, accept his quiet presence. 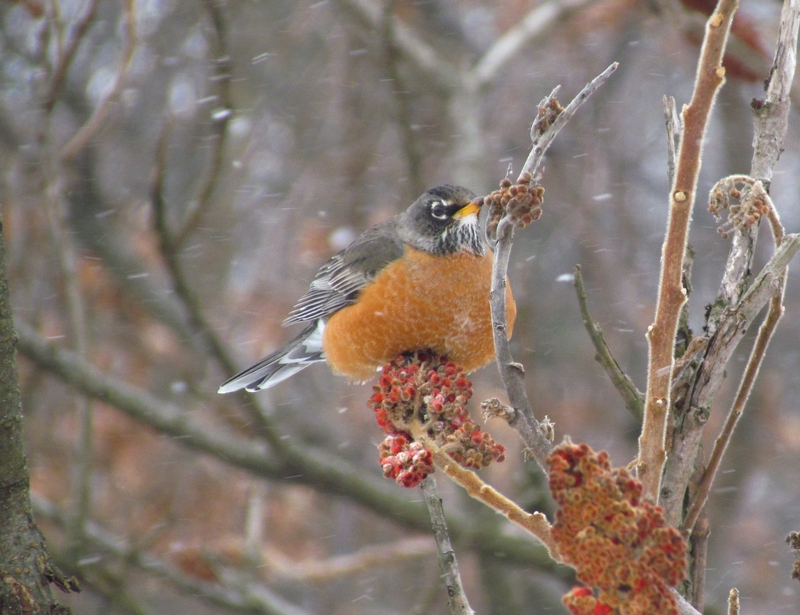 In the dawn’s early light, amidst swirling snowflakes, a robin in search of hibernating bugs pecks at staghorn sumac seed. If a human walks ever so slowly in the dawn’s early light, and sits often to embrace solitude, the greatest encounters may occur. 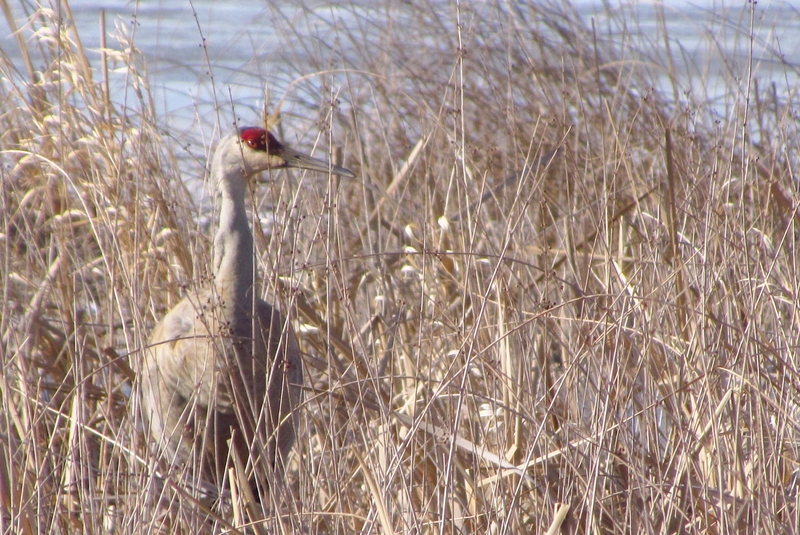 On this blustery morning a sandhill crane is all but hidden among the crackling and swaying cattail stalks, until his head moved slightly and revealed a wary eye. The raw days of November are blessed with beauty and creatures that share the woodlands and wetlands of Oakland County. More often than not, the best time to seek out wonders is during the dawn’s early light, on the Wilder Side of Oakland County. Visit DestinationOakland for details on all 13 Oakland County Parks including their trails, public recreation opportunities and special events.